I’m recommending a play on Baltimore on Tuesday night. I had the Yankees last night and we cashed, but I’m switching sides in this one. C.C. Sabathia allowed five runs and eight hits in 5.2 innings in his first start after missing most of last season due to knee surgery. However, even before surgery Sabathia had trouble with the Orioles as he is 2-4 with a 5.13 ERA against them the last three years and 0-4 and 5.54 at Camden Yards. Current Baltimore hitters have a .783 OPS against the left-hander. 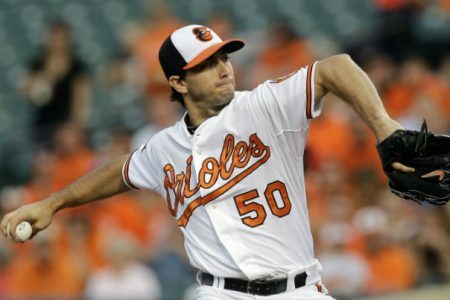 Miguel Gonzalez gave up one run and three hits in 5.2 innings against Tampa Bay and Yankee hitters are batting just .218 against him. Gonzalez is 14-9 in his career at Camden Yards. Baltimore is 35-17 at home dating to last season and even after last night’s loss has won seven of its last 10 at home against the Yankees. I’m recommending a play on the Orioles on Tuesday. Thanks & GL! Scott Spreitzer. Scott Spreitzer SWEPT again last night and aims for his 4th SWEEP in the last 5 days! Scott’s slamming the books with his MLB Tuesday Night KNOCKOUT! Grab the side right here as Scott looks to extend his MLB run to 56-29 with his last 85 releases!